Ottawa Senators captain Erik Karlsson told reporters on Wednesday that doctors removed half of the ankle bone in his foot while in surgery to repair tendons in his foot, according to TSN1200's Dean Brown. Karlsson just told reporters doctors removed half of his ankle bone in the surgery. The defenceman had the surgery in June and finally laced up his skates for the first time last week. Karlsson has not played in any pre-season games but is eyeing a return to the lineup when the Senators start their season on October 5. 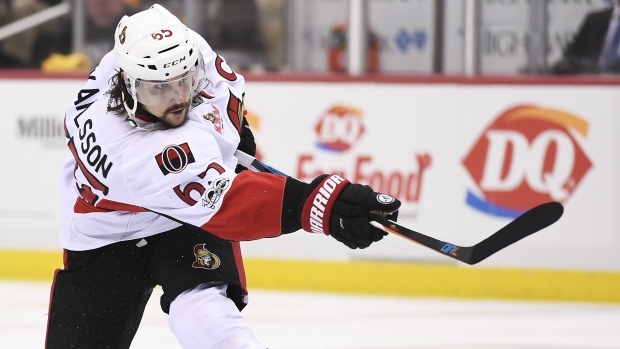 Sens General Manager Pierre Dorion and Head Coach Guy Boucher have not given a complete timeline on when Karlsson could be ready, so his return is still up in the air. Karlsson played all 19 playoff games for Ottawa in the 2017 Stanley Cup playoffs despite having a foot injury and led the team to a Conference Finals berth. The 27-year-old has 456 points in 556 career games and has lead the NHL in scoring by a defenceman in three of the last four years.